In life we all stumble now and then. For those of you who didn't hear, on 22 January a woman taking an adult education class at the Metropolitan Museum accidentally fell into “The Actor.” Painted during Picasso's Rose Period, the 4 feet by 6 foot canvas was completed when he was only 23. There is now, according to the New York Times, "an irregular, six-inch tear running vertically along the lower right-hand corner." Several years ago I was in Paris during la grève. Who knows they are always grève -ing in Paris. Still, it was difficult to get around the city and many things were closed. One afternoon, we found the Musée National Picasso was open and off we went. 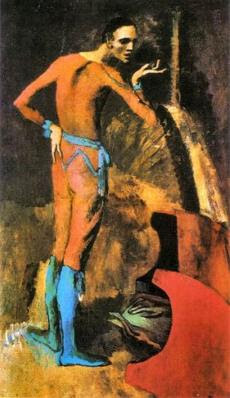 Now the Musée National Picasso is not known for its great collection. There are many inferior works housed there, but it does house the wonderful painting, "Portrait of Marie-Thérèse. "Marie-Thérèse" was tucked in a darkened alcove. Upon exiting said alcove, my shin came into contact with the brass bar rail intended to keep the viewers at bay. The huge brass ball caused me to stagger and in doing so I knocked a painting off the wall. This caused alarms to scream and Japanese tourist to stop dead in their tracks. As I saw the painting move (and to this day I couldn't tell you which painting, but even a crappy Picasso would exceed my budget) I knew I did not have enough traveler's checks to pay for damages if I broke it, so I managed to hold onto the frame and keep the painting from falling as I tried to regain my footing. So there I was, standing in Musée National Picasso holding a Picasso as the alarms blared. I didn't want to move because I didn't want to get shot. The alarms rang and rang and no one came. Remember la grève. So I thought, perhaps I should just re-hang the painting. I was in the process of hanging it when two guards strolled around the corner. One took the painting and hung it while the other worried about my leg. Frankly, fixing my leg would be infinitely cheaper than fixing a Picasso. I recovered. The painting was undamaged. And the Japanese tourists had a great story to tell. My heart goes out to woman at the Metropolitan Museum. Not to make light of the situation -but who else gets to HOLD an actual Picasso! Fascinating and a story to tell for years to come! & Stefan don't get any ideas. What a great story and how beautifully told! Marvellous story with a happy ending, thank god. Marvelous story, indeed. Made me LOL as they say. Perhaps several Kir Royale ahead of your visit contributed to your imbalance? I am no stranger to cocktailing when I visit the Metropolitan Museum here in NY (isn't it civilized -- they serve alcohol at the Met!). I have been to the PM as well, agree the quality of the collection isn't tip top, but the building itself is and its location in the Marais is wonderful. Yes, you held a Picasso!